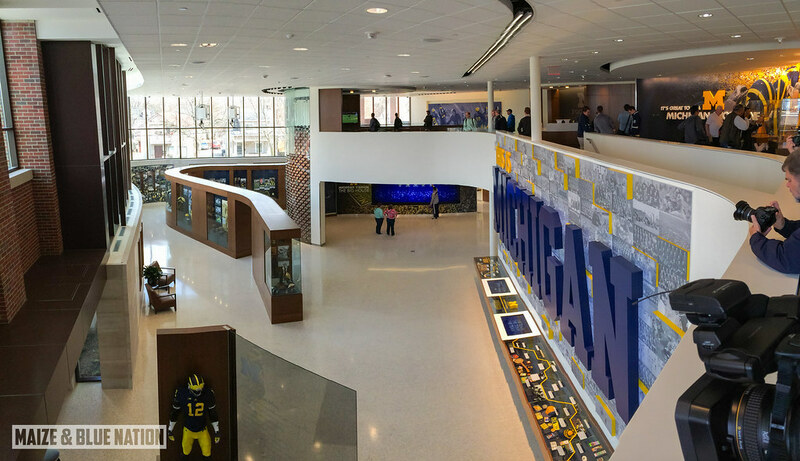 The media was cordially invited to tour the newly remodeled Schembechler Hall this afternoon. As you would expect, I brought a couple cameras along to capture the sights. First impressions, this is a first-class football facility. The fit and finish of the museum is outstanding. Fans will love all of the interactive exhibits and the numerous trophy cases. Highlights for me...the two-story "win wall" featuring footballs commemorating every single Michigan football victory. The "Legends wall" honoring Michigan football "Legends". I didn't have much time to play around with the interactive displays, but they certainly looked cool. The Bo statue outside is really worth checking out. Amazing attention to detail. They captured Bo perfectly. But two things. First, students will need to guard this thing during rivalry weeks. And also, get used to seeing Sparty, Ohio, ND and every other fanbase posing for photos in front of Bo with their school's colors on. It's just a reality of having a statue like this. We also got to go deep into the Schembechler corridors, into the team meeting room, the player lounge and the terrace that looks out to the indoor practice facility. We cruised by the assistant coaches offices as a few were there working...which was cool but awkward all at the same time. But overall, it was a great experience.